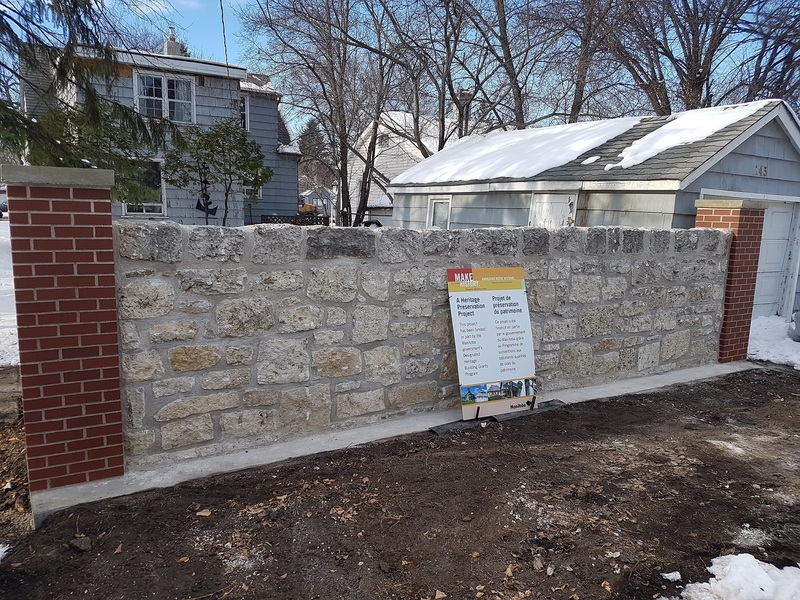 Brandon, MB – The City of Brandon’s Planning, Property & Buildings Department and Brandon’s Municipal Heritage Advisory Committee are pleased to update the community that Phase 1 of the rehabilitation of the iconic stone fence running along the 100-Block of 17th Street is nearing completion. The structure – a rare example of stone fence construction still standing in Brandon – has borne a Municipal Heritage Site designation since 2003. The original fence was constructed in the early 1900’s and encompassed a single estate prior to post-Second World War development. Now, what remains of the structure straddles several private and public property lines along the north, east, and south borders of the block, but is owned and maintained by the City of Brandon. Led by the City of Brandon’s Planning, Property & Buildings Department and Brandon’s Municipal Heritage Advisory Committee, repair work began last summer on portions of the fence that were cracked and significantly leaning, specifically an eight-metre section of fence located at the rear of 143 – 18th Street. Brandon City Council approved $25,000 in funding in its 2017 budget to allow for the rehabilitation, while a further $10,000 in funding was secured through the Province of Manitoba’s Designated Heritage Buildings Grant Program. City of Brandon Heritage Community Planner Andrew Mok says the majority of Phase 1 work was completed last November by project contractor Stiles Masonry, with some minor site work still to be done in the spring. Mok adds that funding is currently being sought for Phase 2 of the project to occur in 2018, which would see the rehabilitation of an 11-metre section of the fence located at the northeast corner of the property at 147 – 18th Street. A number of trees have already been removed from the immediate area surrounding this section in preparation for this work; however, the area is currently fenced off to maintain public safety. A full history of the stone fence can be found on the Heritage Brandon website at http://heritagebrandon.ca/municipal/stone-fence.